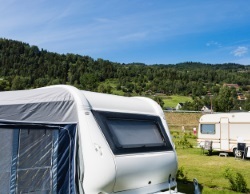 Offering both commercial and residential caravan repairs in the Cheltenham area, PGF Caravan Services can provide a mobile repair service so can visit you at your current location or site. With all of our team registered with the Mobile Caravan Engineers Association, you can rest assured that all of our work is carried out to the highest possible standards, and fully guaranteed. Carrying out pre-season and post-season servicing for your caravan, we can ensure that your holiday is not disrupted by any preventable cause. Offering both single and twin axle servicing either at your home or campsite, we can offer repair or replacement, allowing for easier manoeuvre of your caravan. If you spot signs of damp, contact us today for our thorough damp testing service, to prevent mould and mildew posing a risk to your health. We understand that your caravan breaking down can be an annoying disruption to your holiday, which is why we offer a mobile breakdown repair service, so we can come and visit you at your site in Cheltenham. PGF Caravan Services have experience in both interior and exterior caravan repairs and replacements, so no matter the part, we can help. If you cannot see your required service listed above, please do not hesitate to call us today on 01452 553 288 or visit our full services page here. Just like you would get your car serviced annually, you should get your caravan serviced once a year to ensure it is operating efficiently and there are no problems. One of the main focuses of our annual servicing is doing a thorough damp test for your caravan, as the build up of damp and mould has been known to be dangerous to you and your family. We can run damp tests to spot the signs that aren’t as obvious as black spots and smells and prevent the problem before it occurs. Service your caravan today to ensure your ball acting stabiliser is in working order and is sturdy enough for any journey. Checking the electricity within your caravan is important as especially in the colder months it is essential that everything is in full working order. Providing wheel and brake inspection, we can check whether your pressure and tread depths are suitable for use on the roads, which is fundamental especially for long journeys. We also perform thorough checks of your drawbar and gas systems in order to ensure your caravan is operating safely. Our caravan repair services are available to clients living in Cheltenham and the surrounding areas, however, we also offer them to visitors who have broken down on their travels, or require repair services on a nearby campsite. Located on the edge of the Cotswolds and easily accessible from the M5, Cheltenham boasts many things to do with the whole family when visiting in your caravan. With local activities fit for the whole family, Cheltenham boasts excellent spa facilities and is famous for hosting regular festivals. Are you visiting Cheltenham and have broken down or need caravan repairs? Contact PGF Caravan services today on 01452 553 288. Famous for its horse racing course and events, Cheltenham has an impressive jockey club racecourse where the Cheltenham Festival and many horse races are held. With museums such as The Wilson, there is lots of history behind the town of Cheltenham, as it is the birthplace of Gustav Holst. We understand that whether you are at home or out on holiday in your caravan, it can be quite difficult to source caravan parts to replace your broken ones. Here at PGF Caravan Services we can provide you with a wide range of parts to replace your existing ones with, and we aspire to take on any repair job. Repairing any faulty or damaged parts of your caravan, we can identify the necessary problem with your appliances such as your doors, furniture and floor. Damage that has been caused by damp may take longer, however we are willing to take on any repair job no matter how big. To view some of our work that we have done on caravans, visit our gallery page. Whether you have completely broken down or just had a minor accident, we will come to your location with the necessary tools to repair the component or replace it when necessary. Offering a call out service to Cheltenham and the surrounding areas of Gloucestershire, we can repair your tyres, electrical work or chassis when required. Our caravan engineers are experts at identifying the cause of your breakdown and repairing the problem in the quickest time possible in order to cause the least disruption to your holiday. Regardless of the size caravan you have, we offer emergency breakdown services to all clients, as there are no size restrictions. Offering comprehensive caravan repairs all around Gloucestershire, PGF Caravan services can provide a parts replacement service as we have a range of brands available. Whether you require our refurbishment or breakdown services, we can provide a tailored service that comes to you. For repairs and servicing in the Cheltenham area, contact us today.